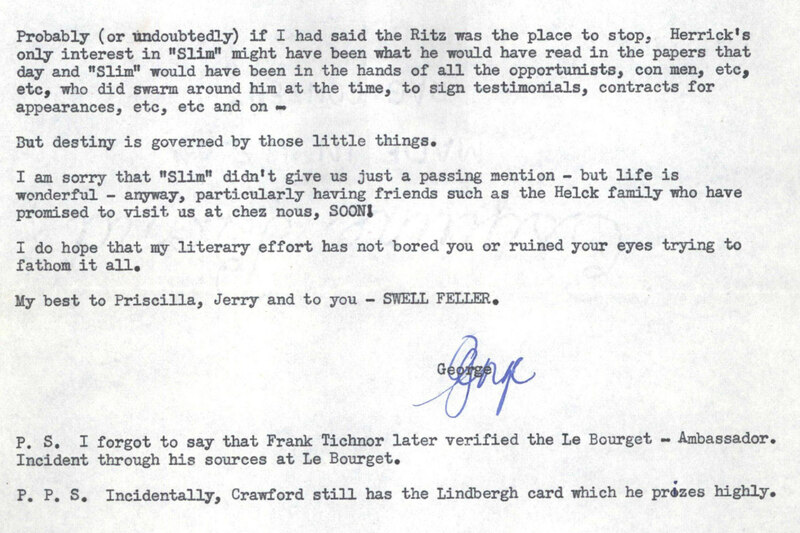 George Robertson wrote this letter on May 12, 1953 to his friend artist Peter Helck. 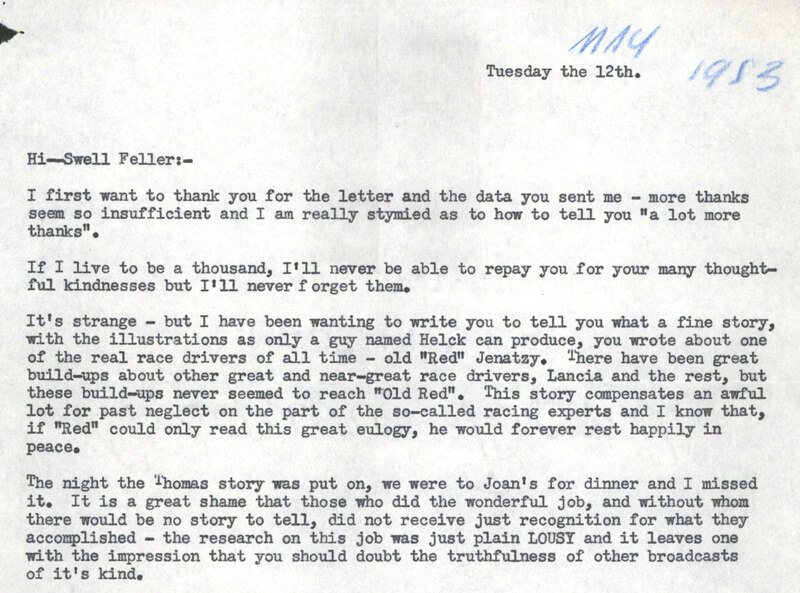 He began the letter congratulating Helck on a story he wrote on driver Camille "Old Red" Jenatzy. Robertson noted that sometimes you need to "doubt the truthfulness" of stories. 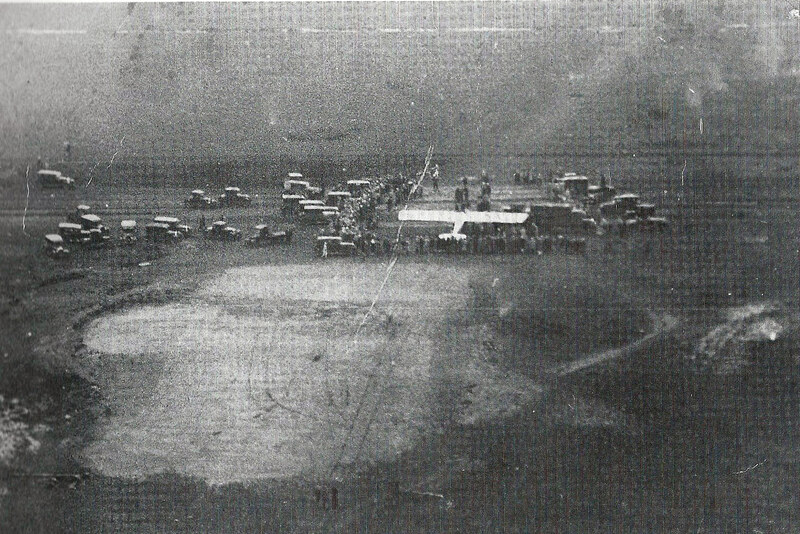 Robertson describes his "story" of the morning of Lindbergh's historic take-off from Roosevelt Field on May 20, 1927, 26 years earlier and shortly after Lindbergh published his own account in the Saturday Evening Post. "I was very friendly with Frank Tichenor, who was owner and publisher of Aero Digest. 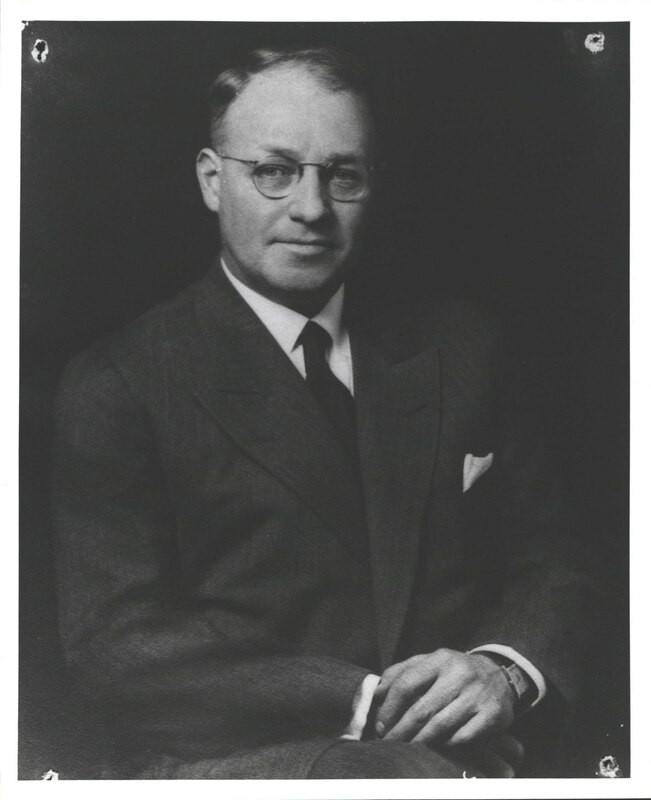 I was in charge of the Lincoln Division of the Ford Motor Company in the East at the time. Frank called the day before the next morning take-off and asked me to take him to Garden City that night in order that he could talk with "Slim", as they were very good friends. I agreed and we went to Garden City that night, also having on board my young son, Crawford and a neighbor's young son, Red (Ned) Scott." "Anyhoo-"Slim" got into the Lincoln in the rear bewtwee the two boys, and we started for the hangar at Roosevelt Field in a down pour of heavy rain. 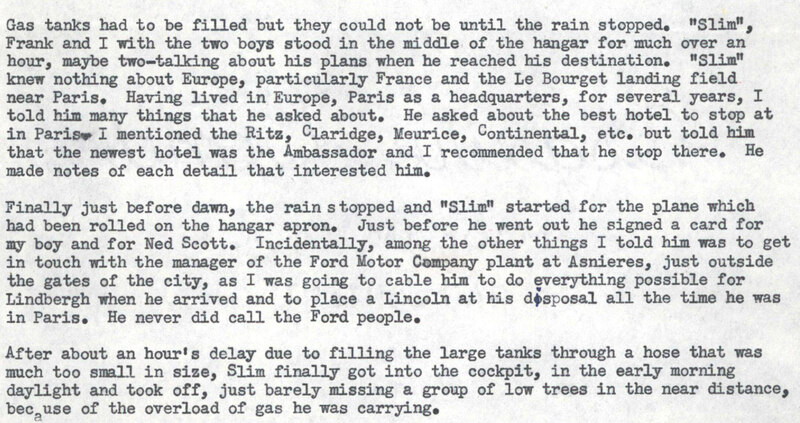 We all unloaded at the hangar and got out of the rain." "Slim", Frank and I with the two boys stood in the middle of the hangar for much over an hour, maybe two- talking about his plans when he reached his destination...He asked about the best hotel to stop in Paris ..I told him the newest hotel was the Ambassador." 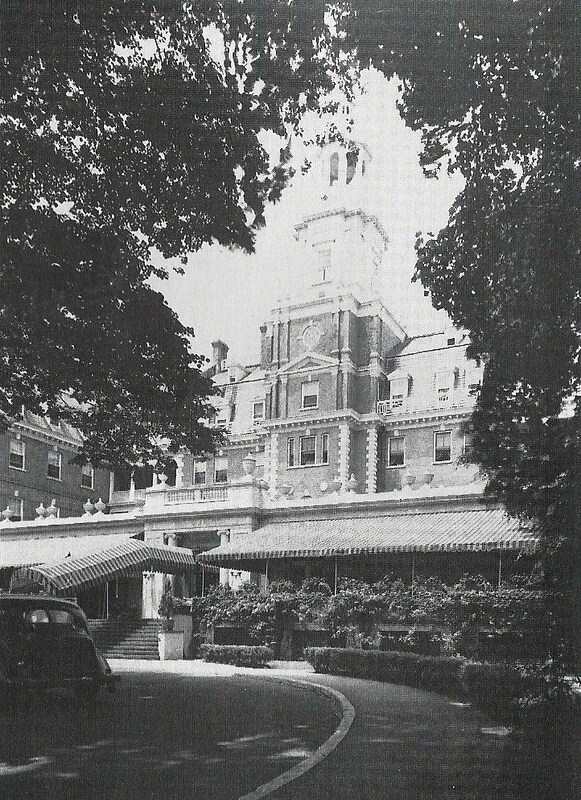 "When he reached the field, a very large crowd had surrounded the plane..Lindbergh called out "Ambassador", "Ambassador"...The outcome was the people on the field thought he was calling for the American Ambassador and someone called the American Embassy...Instead of the Ambassador Hotel, the American Ambassor was the result." "I am sorry that "Slim" didn't give use just a passing mention- but life is wonderful- anyway, particularly having friends such as the Helck family.."
More documentation on this story will be posted next week. This website features four amazing videos of Lindbergh's flight from Roosevelt Field to Paris. Part 2 describes the night of May 19, 1927 and the morning of May 20, 1027. Part 3 shows a spectacular film of the takeoff. Watch Lindbergh barely make it over the telephone wires on Merrick Avenue. Actual videos of Lindbergh’s flight—very impressive. Vanderbit family fortune made with ferries and railroads. Can you and your readers come up with additional LIMP and Vanderbit Cup links to other transportation modes? The photos taken prior to the flight with the “Spirit” missing the spinner & prop are taken at Curtiss Field where the plane was housed. It would take off from the field to the east - Roosevelt Field. 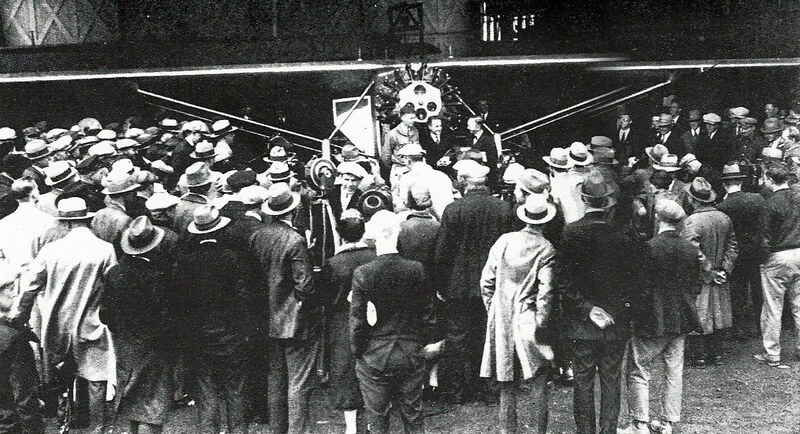 As per the NASM website: “While Lindbergh was flying the “Spirit” on its maiden flight from San Diego to Long Island on May 12, 1927, a crack developed in the aluminum behind the propeller, forcing him to replace the propeller spinner and nose cone just before his historic flight from New York to Paris.” The original damaged nose cone is in the NASM collection. Thank you so much for the wonderful story about Lindbergh’s flight and the priceless film that goes with it. I blew the dust off my Peter Helck books and read them again. Wonderful books, and a wonderful story. Thanks again, Michael.